Goodyear’s newest blimp is flying. Wingfoot Three took off about 8:55 a.m. Monday into the rising sun at the Wingfoot Lake blimp base where it was built. Airship technicians dismiss from a preflight meeting. The semirigid airship revved its engines, disconnected from its mast truck, backed up a bit and then slowly rose. The airship circled the hangar and then headed out for its first flight test, which was expected to last between five and six hours. 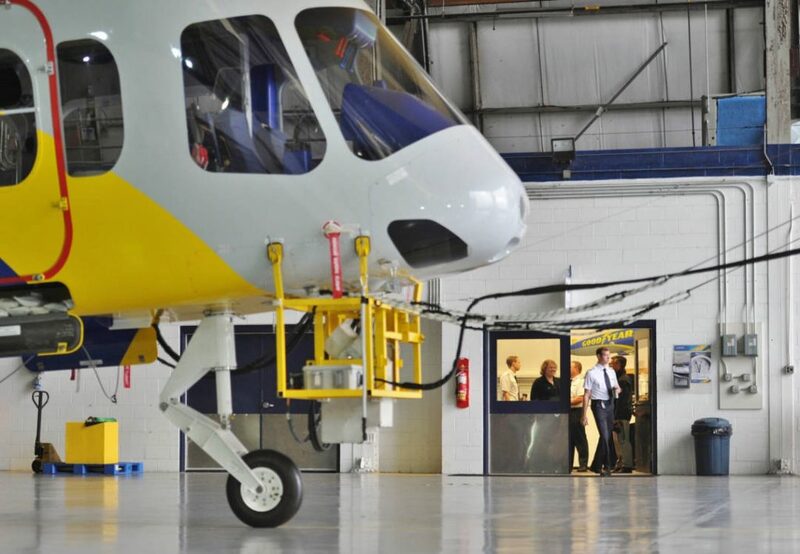 A crew member uses a lift to do a preflight check on Wingfoot Three in the hangar before the first test flight. Weather conditions were ideal: a slight breeze, cool temperatures and bright sunshine with high clouds. Roger Durfee was among a couple of people who witnessed the takeoff from the blimp base’s public viewing area. 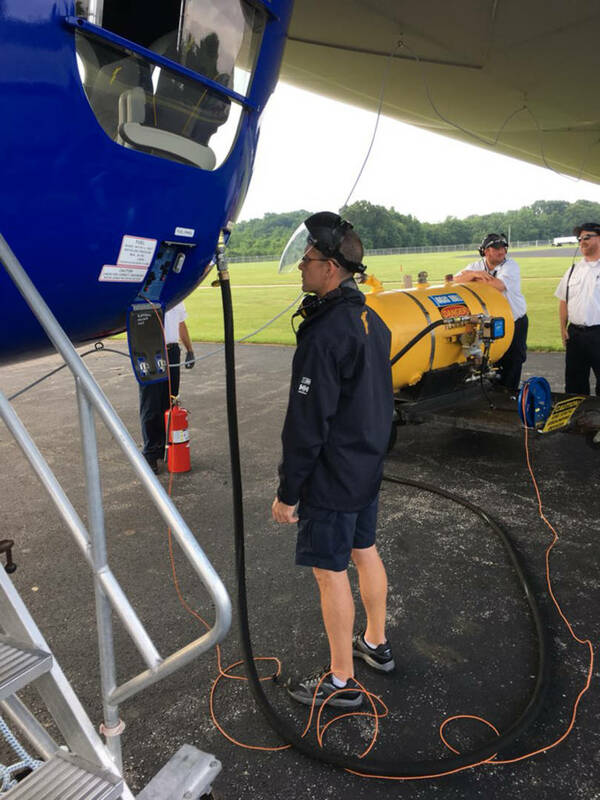 Goodyear’s Wingfoot Three is getting ready for its maiden flight Monday, June 25, 2018. Durfee, who retired recently as a conductor for Norfolk Southern Railway, said he grew up near the Goodyear hangar. His parents used to bring him out to watch the blimps and go for ice cream. He’s a member of the Northeast Ohio Blimp Spotters, a group of avid blimp fans who have a Facebook page. Airship crew members guide Goodyear’s newest blimp, Wingfoot Three, out of the hangar for an early-morning test flight. 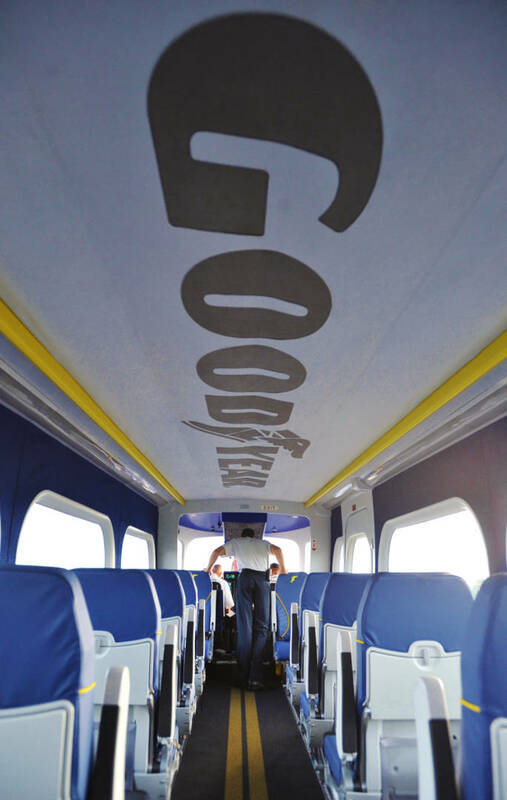 Michael Dougherty had quite a different viewpoint — looking out from inside Wingfoot Three’s gondola. Dougherty is a chief pilot with Goodyear and part of the test flight crew, made up of two pilots and three engineers. Goodyear’s newest blimp, Wingfoot Three, makes its way out of the hangar. Tests include the avionics system, or flight instruments, as well, he said. 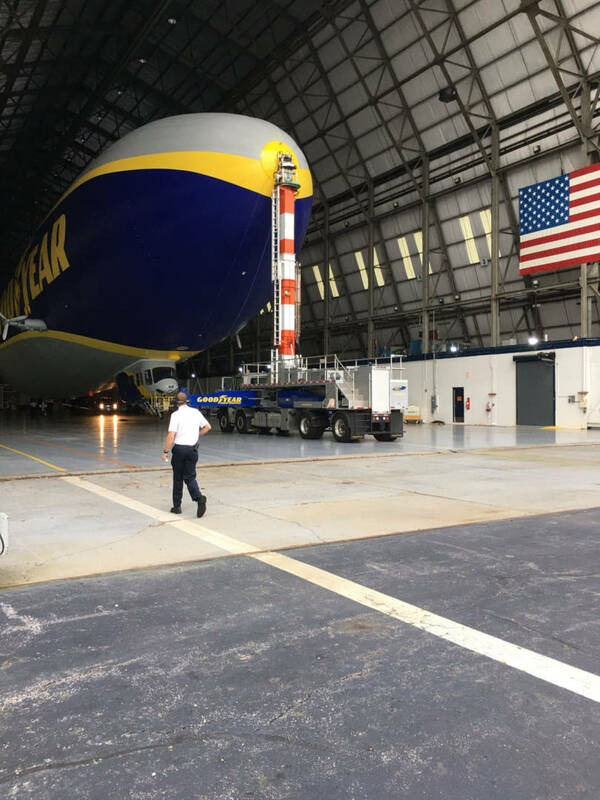 Airship crew members guide Goodyear’s newest blimp, Wingfoot Three, out of the hangar. Photo: Jeff Lange/ABJ/Ohio.com. “Most of our flying will be between here and Akron-Canton Airport,” he said. The airship currently is restricted by the Federal Aviation Administration to a specific flight authorization area, Dougherty said. “So we’ll stick to our space southeast of Akron,” he said. Crew members conduct a pre-flight check up on Goodyear’s newest blimp, Wingfoot Three, as the morning sun rises over Wingfoot Lake. Wingfoot Three is under the command of Oliver Jaeger, test pilot for the blimp’s German manufacturer, Zeppelin. “He’ll be the pilot in command, and I’ll be assisting,” Dougherty said. Goodyear’s Wingfoot Three airship is getting fueled up before first flight. 100 octane low lead aircraft fuel is being pumped in . . . about 161 gallons. Wingfoot Three flew over Goodyear’s headquarters in East Akron, circling the building about 10 a.m. and then heading out. The first flight required an early work start, with a lot of hangar crew at the base before 6 a.m.
Zeppelin employee Andreas Löhning (right) discusses Wingfoot Three with another employee. 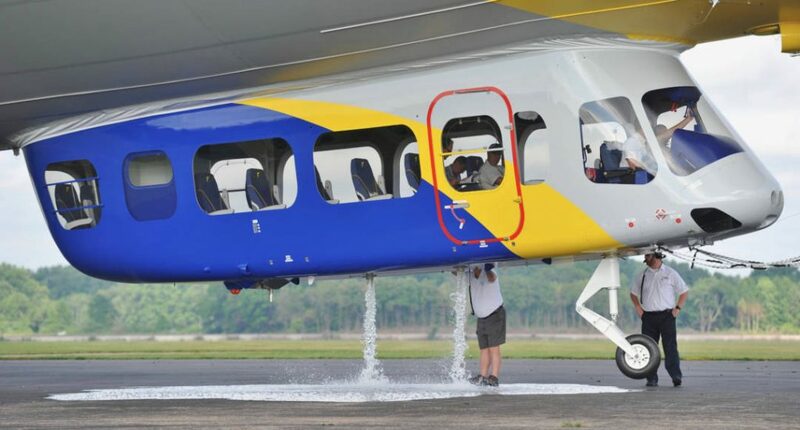 Crew members release the water ballast from the gondola of Wingfoot Three. 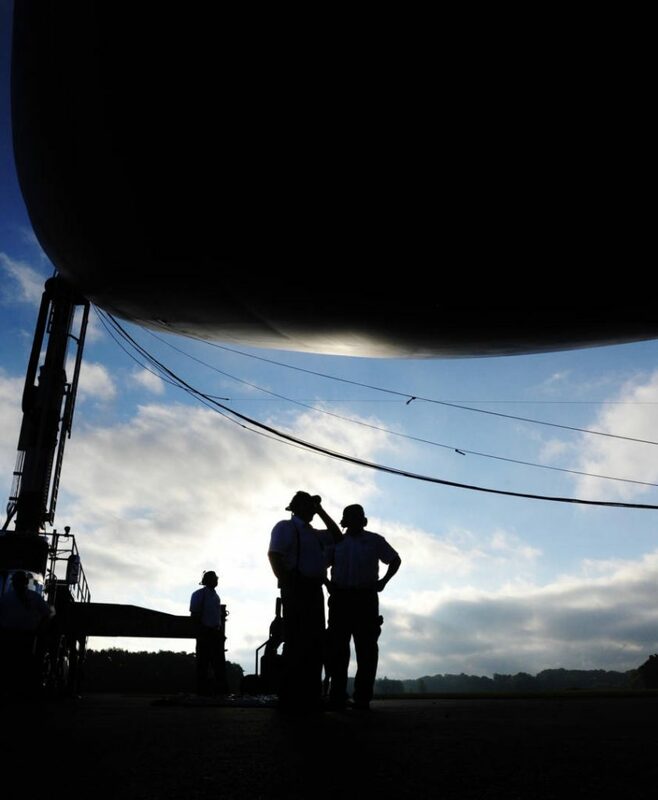 Following a preflight meeting, crew members pulled the airship from the hangar after 6:30 a.m. Some 161 gallons of 100-octane, low-lead aircraft fuel were pumped into the craft’s tanks by 7:10 a.m., with the engines started at 7:35 a.m. and kept running. Wingfoot Three remained anchored to its mast truck as the crew went through an extensive pre-flight checklist. 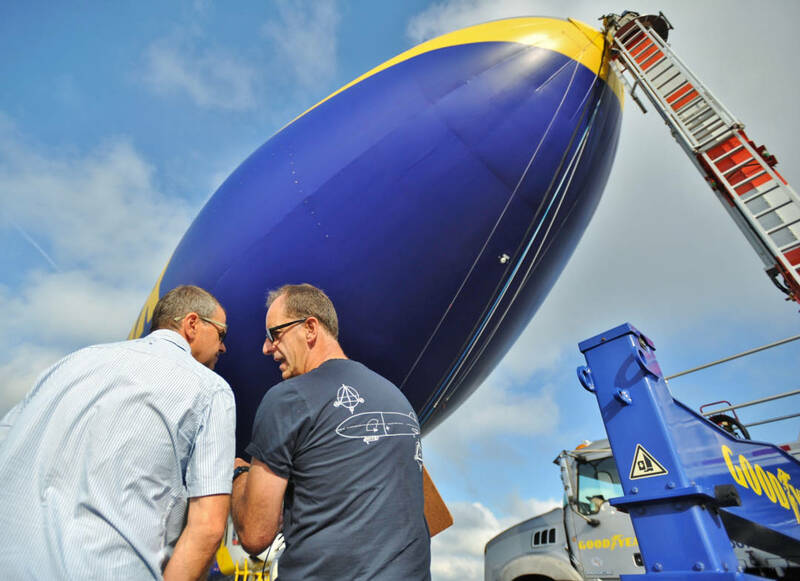 Goodyear’s new Wingfoot Three airship is out of the hangar and will run its engines before being unhitched from its mast truck for its first test flight. 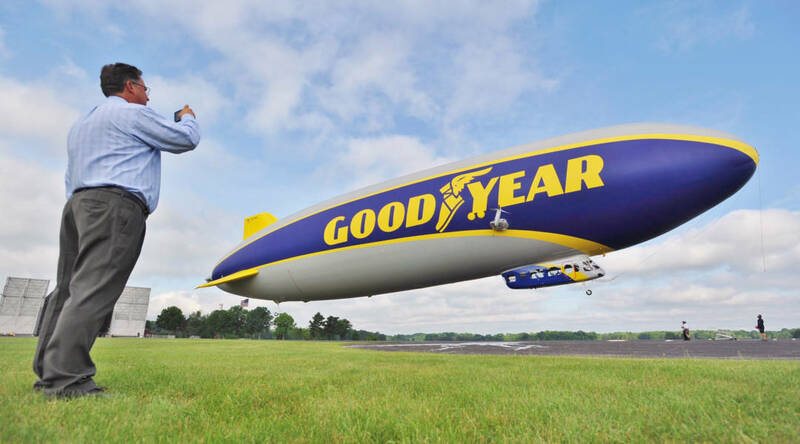 General crewman Steve Uhle looks on at Goodyear’s newest blimp, Wingfoot Three, prior to a test flight. Once the preflight items were crossed off, crew members disconnected an electric line and removed a small metal cage under the gondola nose and took away the ladder from the gondola door. Then, the flight crew opened a valve that dumped gallons of water ballast underneath the gondola. 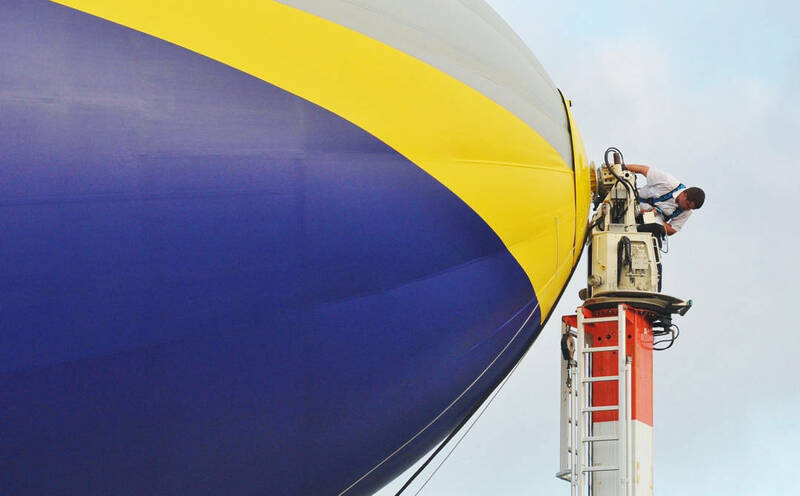 An airship crew member works to detach Wingfoot 3 from the mooring mast. 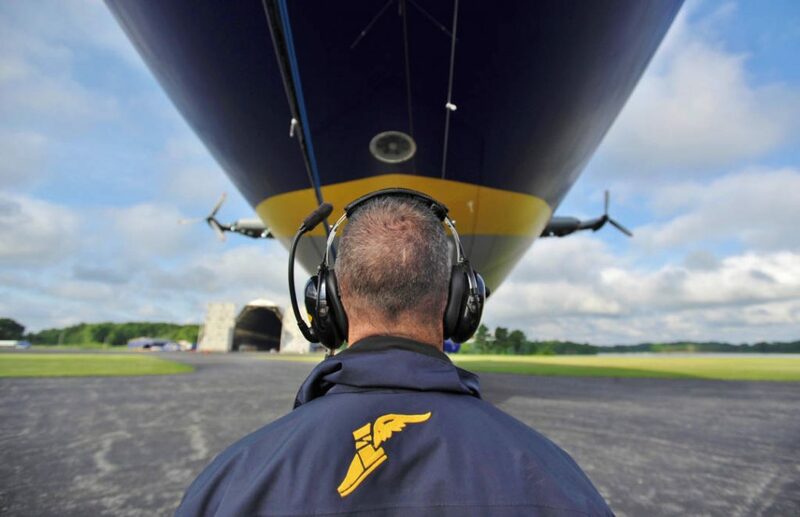 Goodyear pilot Michael Dougherty conducts a pre-flight check up in the gondola of Wingfoot Three. 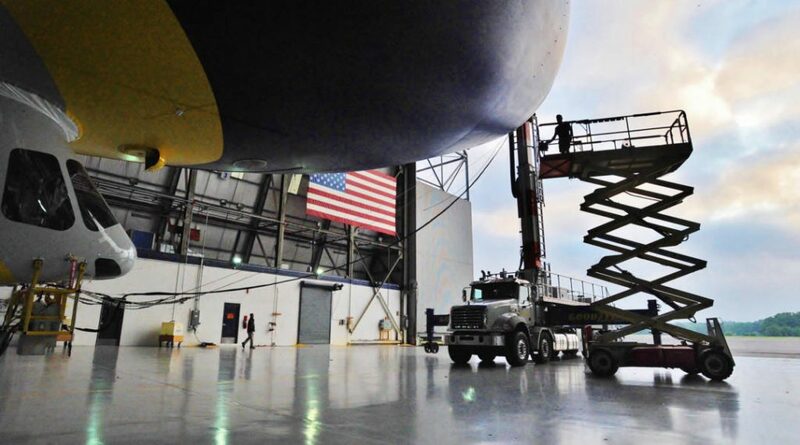 A crew member disconnected the mast truck from the blimp and Wingfoot Three was away. 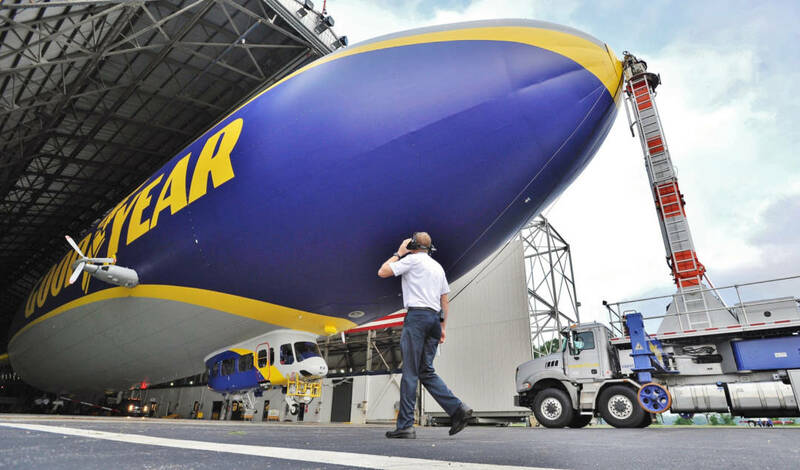 The airship was back in the hangar about 2 p.m. Goodyear said the flight went well. 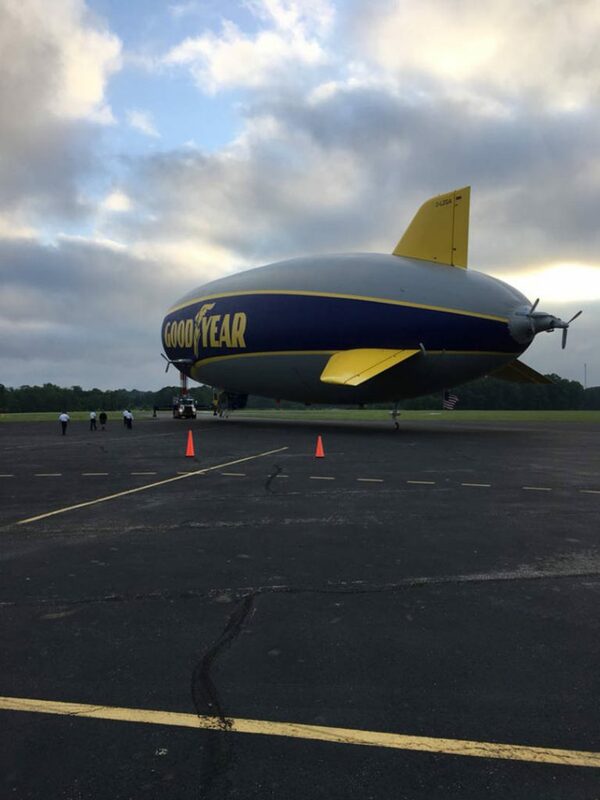 Goodyear’s newest blimp, Wingfoot Three, warms up for an early-morning test flight. 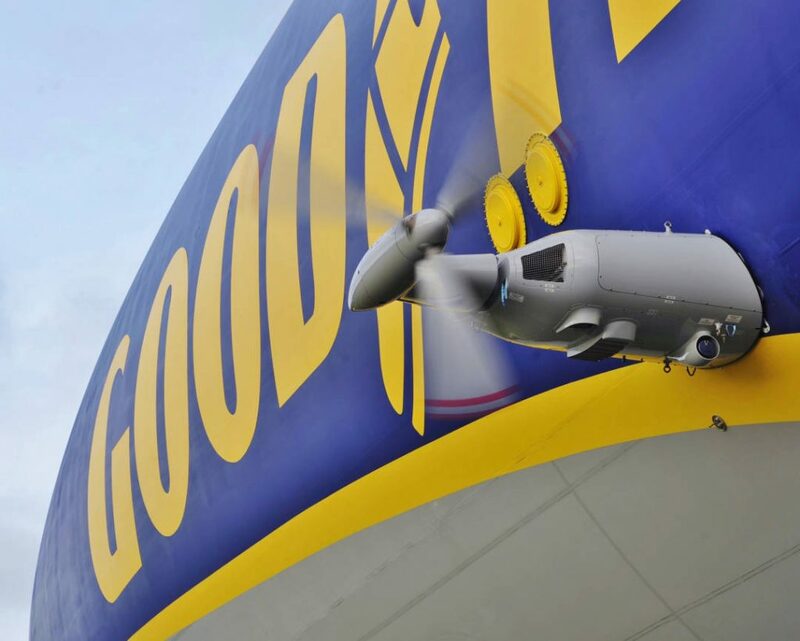 Goodyear took Wingfoot Three out of the hangar for the first time on June 21, the first day of summer, for preflight testing. Weekend rain and winds pushed back the first flight to Monday. Director of Airships, Chris Kostiuk, records liftoff with his cell phone early Monday morning at the Goodyear airship hangar at Wingfoot Lake in Suffield. 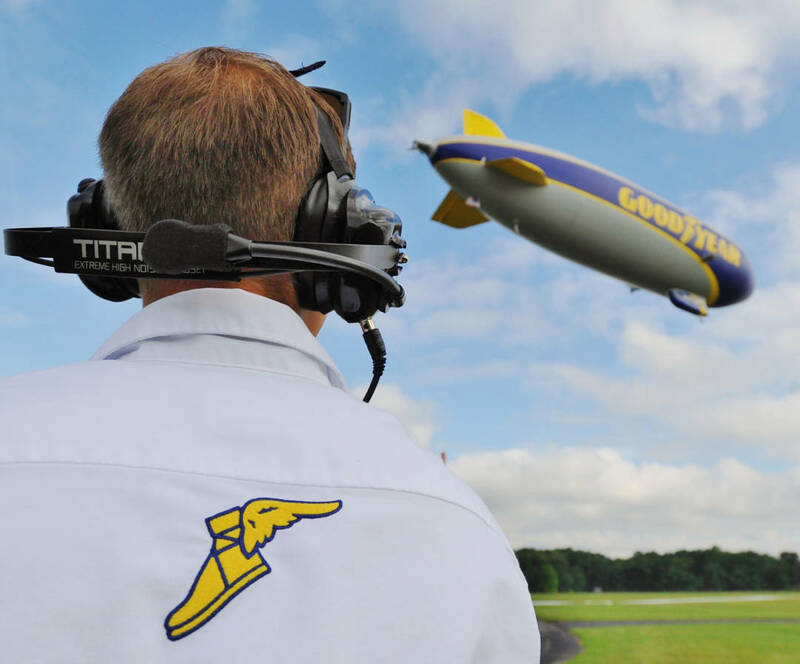 William Gould, senior broadcast technician for Goodyear, watches as Wingfoot Three lifts off. 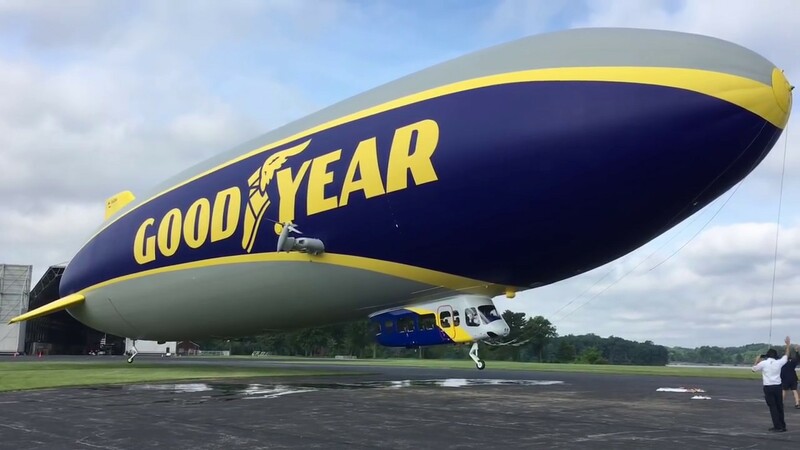 The airship will be a familiar sight in Northeast Ohio skies since it will be based at the hangar in Portage County’s Suffield Township. 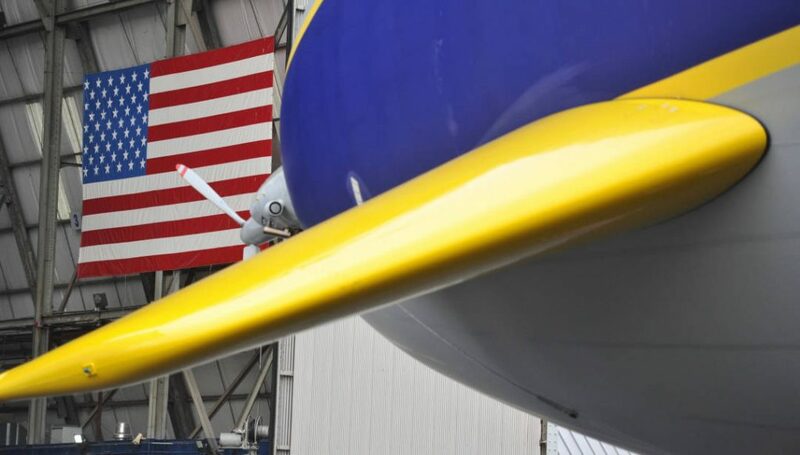 Wingfoot One, which first flew in 2014, is now based in Florida but is currently traveling the Midwest. Wingfoot Two is based in California and first flew in 2016. All three airships were built in Suffield Township. 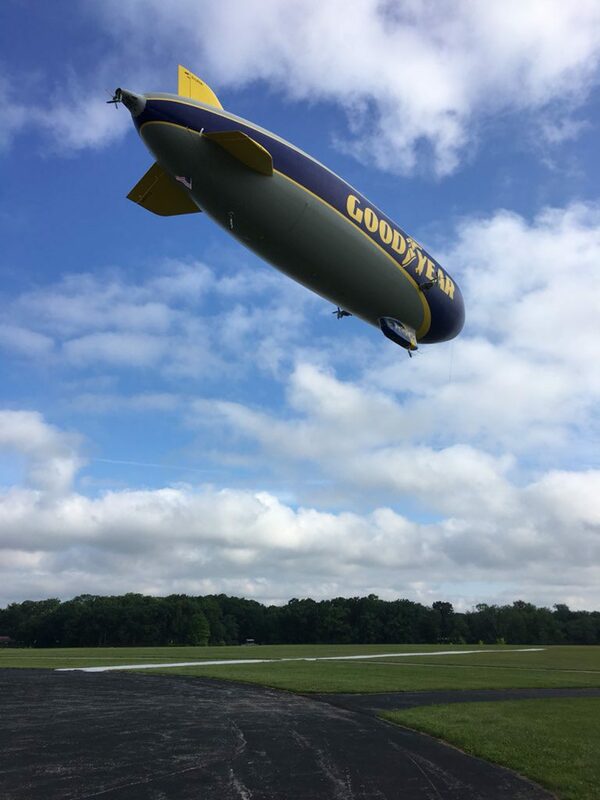 Goodyear’s newest airship Wingfoot Three took off at 8:55 a.m. Monday, June 25, 2018, on its maiden voyage. 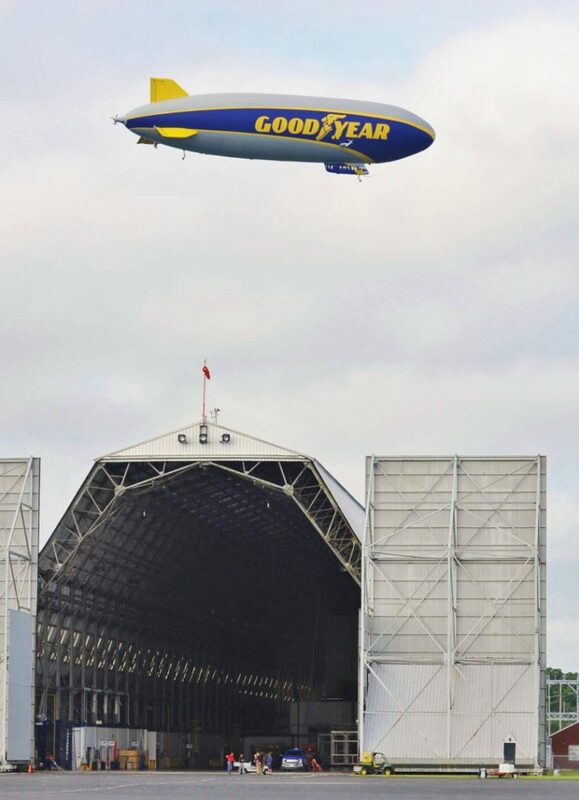 Wingfoot Three flies over the Goodyear air hangar. 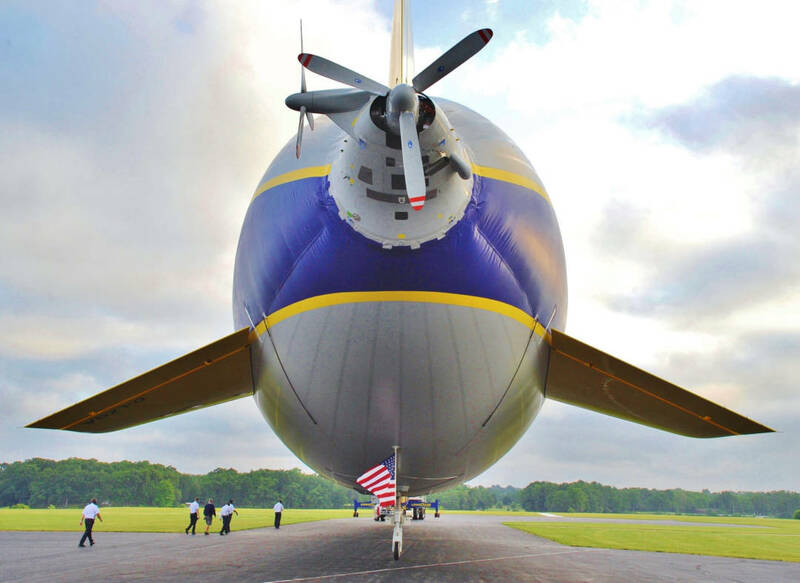 Wingfoot Three is the final of three New Technology, or NT, airships that Zeppelin has built for Goodyear. 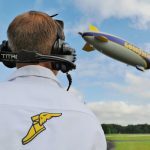 Technically, Wingfoot Three isn’t Goodyear’s blimp yet. 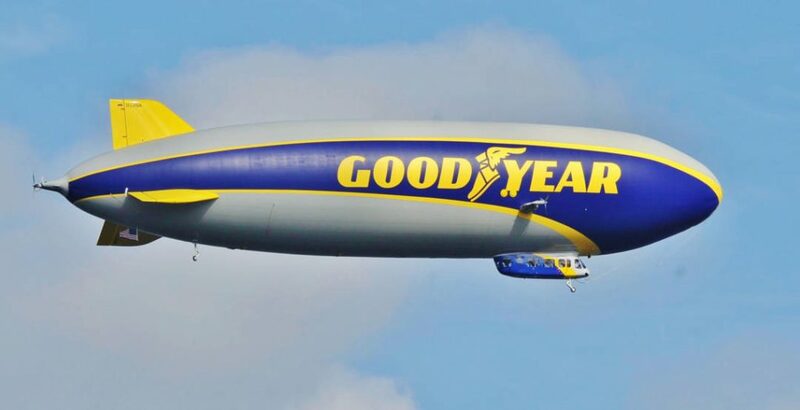 It belongs to Zeppelin until the airship passes all of its tests — likely weeks more of flying — and then will be turned over to Goodyear. This entry was posted in Airships, Blimps, Dirigible, Semi-Rigid and tagged airship, Akron, blimp, Blimp Hangar, Blimp NT, dirigible, Goodyear blimp, Wingfoot Three, zeppelin. Bookmark the permalink.